Of first interest to the young men, along this line, will be athletics and outdoor exercises. If possible, each ward should have an organized baseball club, and each stake should have an organized baseball league, so that there will be something to occupy the young men during the entire summer season in outdoor activity exercises of a competitive character that will give them something to think about, to fight for and to work for. Then you can have for evening work, dramatics. See to it that encouragement is given by this organization of “M” Men, to dramatics, so that you can bring in the talent of your wards and give them something to present to the public, serving at least two purposes, activity—occupation for the boys themselves—and entertainment and education for the people of the ward. Then you have your Fathers and Sons’ outings. You know something about them. Get your fathers and their sons together, have an outing, a time of pleasure, recreation, education, and training for the boys and for the fathers, in association together. You can have your mountain hikes. All of these and many others I can not mention for lack of time, are outdoor activities for the “M” Men. One of the things lost when the Church converted the MIA program into today’s Young Men and Young Women’s programs is the emphasis on life outside of the Church. Things like recreation, physical fitness, and non-religious knowledge, while still taught in Church, are no longer a significant part of the Church’s program—we are to find these things by interacting with organizations outside of the Church. And it seems like that trend has increased over the years—the ward softball and basketball teams of my youth are long gone as far as I can tell. Perhaps that isn’t the role of the Church, but hasn’t the result been that many Church members get little or no physical exercise instead of moving them to physical exercise and recreation in their communities? Perhaps our history should give us pause. Whether it’s baseball, or dancing, or other forms of recreation/physical activity, and all the sociability and executive training that went along with them, we did lose something about 1970 when all this died. Perhaps most relevant to the present and future, I think that if we were ever to adopt the much-discussed idea of canceling Sunday School and making families and individuals fully responsible for gospel/scripture learning, the same thing would happen: A few people with a natural interest in those things would continue to study, but the majority of Latter-day Saints would never get around to it. Most of us don’t pick up anything that requires effort and discipline — whether it’s exercise or study — without some external encouragement and structure. Our stake here in the Bay Area still has an (adult, co-ed) softball league, as well as a basketball and volleyball league. 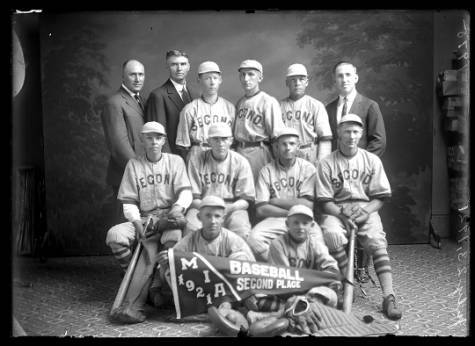 Nothing like the mid-1900, when there were serious uniforms, church-wide tournaments, etc., but there are vestiges.